Nabi Saleh: The weekly protest against the wall and settlements in Nabi Saleh similarly experienced severe repression by the IOF. The march began in the centre of the village, and residents and international activists expressed their solidarity with Gaza, which has been subject to frequent bombing raids by Israel in the last 10 days. The marchers chanted slogans demanding an end to the occupation, the removal of settlements and calling for support for the residents of Gaza and Al Quds (Jerusalem) and solidarity with the prisoners. 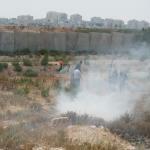 The IOF then proceeded to bombard the demonstrators with rubber coated bullets, tear gas, sound bombs and skunk water. The IOF have tightened its siege on the village in recent weeks, with many residents and visitors being subject to questioning. On Thursday night the Israelis raided the village leading to some confrontations but no reported arrests. Ni’lin: The weekly demonstration after Friday prayers in the town of Ni’lin was met with tear gas and rubber bullets on its arrival at the apartheid wall. Dozens suffered from temporary suffocation due to inhalation of the tear gas, which led to clashes between young participants in the march and the IOF which continued for hours into the afternoon. The IOF has recently launched a campaign of arrests in the town, arresting a number of citizens on the charges of belonging to the Popular Resistance including activist photographer, Hassan Khaled Hassan, and activist Ahmed Abdullah Amira.